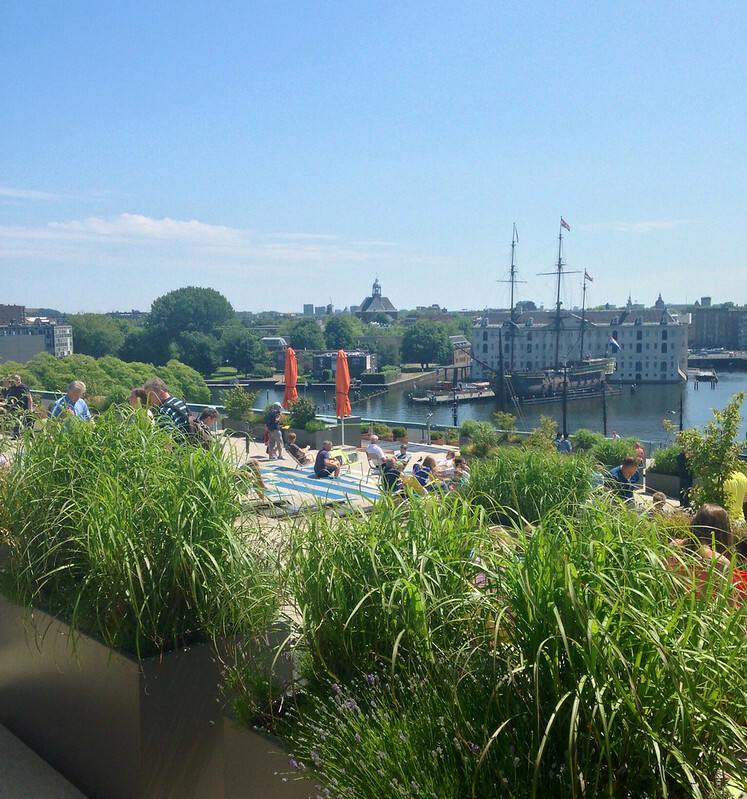 When I’m only in a city for a couple of days, I like to know I’m making the most of my time, so I’ve found tips from locals or those that have visited are really useful in ensuring I’m hitting up all the best places. 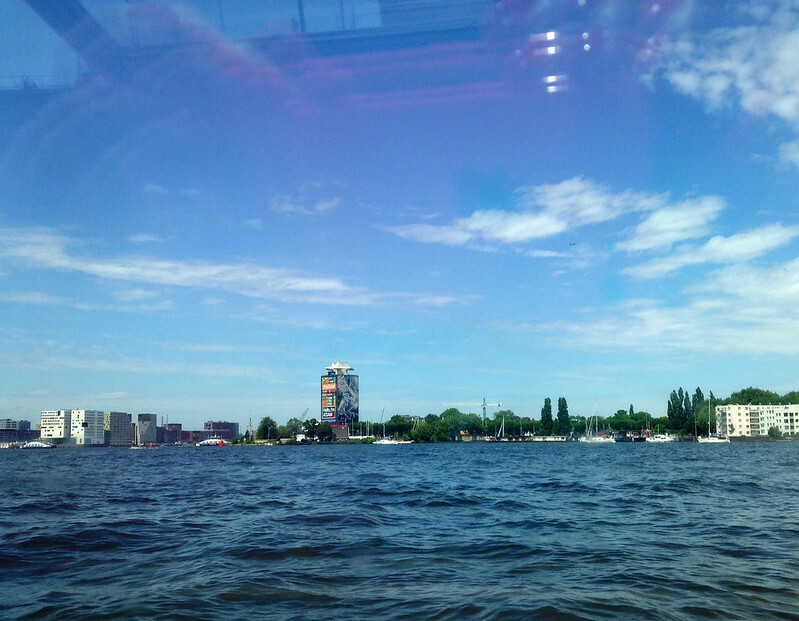 Amsterdam seems like one of those cities that almost everyone I had spoken to has visited at some point, so I had quite a few tips for places to visit. So, I’ve decided to share some of these tips on here, as a nice departure from the constant running chat. Some were recommendations from friends, some from locals and some just stumbled upon – the perfect combination. I might even go back to some of the other trips I’ve made recently and round up the best places from each of those too. 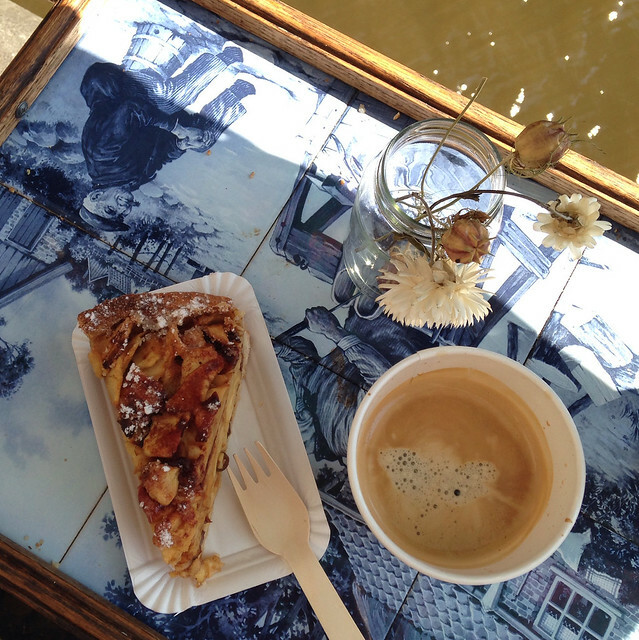 In general, I didn’t love Amsterdam for the food. We stayed in a very touristy, very central part of the city and the food was more ‘Spanish resort’ than I had anticipated. Proper, good main meals were tricky to find, but we quickly discovered that if you’ve got a sweet tooth, the city is amazing. This place was recommended to us by Harry, but we also found it mentioned in my pocket Lonely Planet guide as “popular with locals”. It might have been at one point, but it certainly isn’t now – the place was full of Brits, Americans and Canadians! We arrived just before 10am on Saturday morning, with a queue already having formed down the street. Once the doors opened, the queue moved inside as the tables filled, and although we weren’t lucky enough to secure a first sitting, we were at the front and managed to get a table outside in the sun after about a half hour wait. 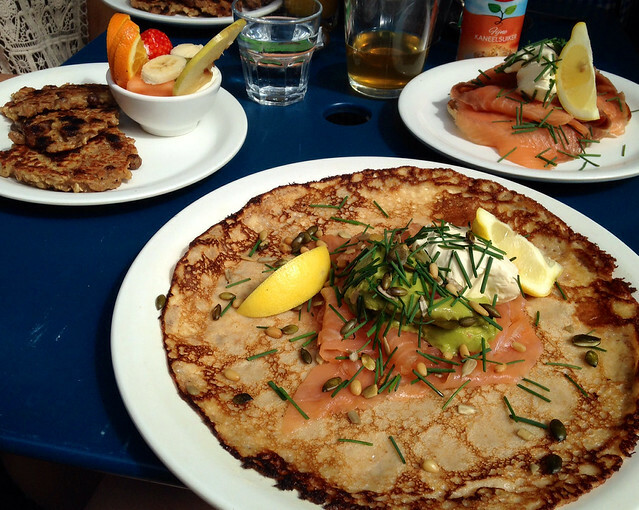 I shared my breakfast with Charlie – we went for one savoury option (smoked salmon, crème fraîche, guacamole & dill – €12.50) and one sweet (muesli pancakes with yogurt and fruit, a breakfast option that also comes with tea or coffee and orange juice – €10.50). Both were delicious, generous portions and really hit the spot. We ended up spending quite a while sat enjoying the vast range of teas and soaking up the morning rays. I’d definitely recommend here for the food, if not the authentic Dutch clientele. But get there early! 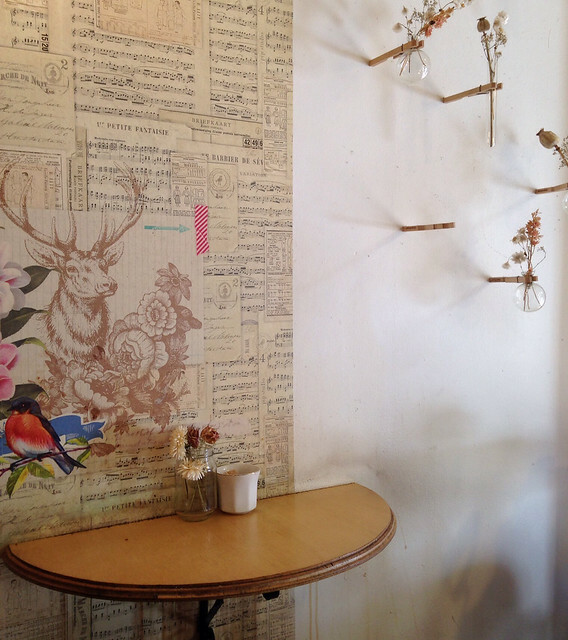 This place was a beautiful little find during our final few hours in the city. 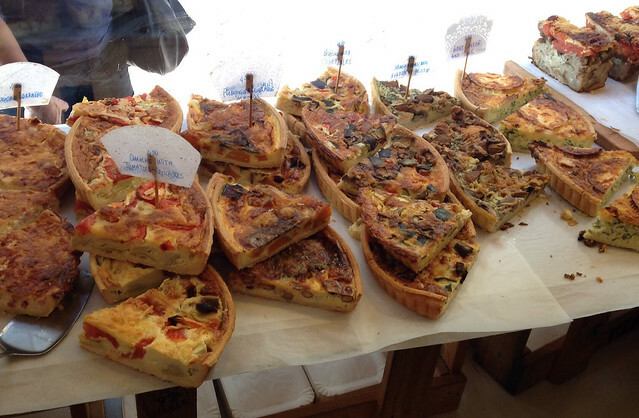 We were wandering back in the direction of our hotel to pick up our luggage and the two windows – one full of cakes, the other full of savoury tarts – stopped us in our tracks as we passed by. We had to go in and between me and Charlie we shared a giant slab of apple tart over coffees. The place had the cutest, tiny little balcony overlooking the canal where we sat and watched all the boats pass by enjoying the Sunday afternoon heat. Another recommendation from Harry was De Taart van m’n Tante, which Google translate helpfully tells me means ‘The Cake of my Aunt’. 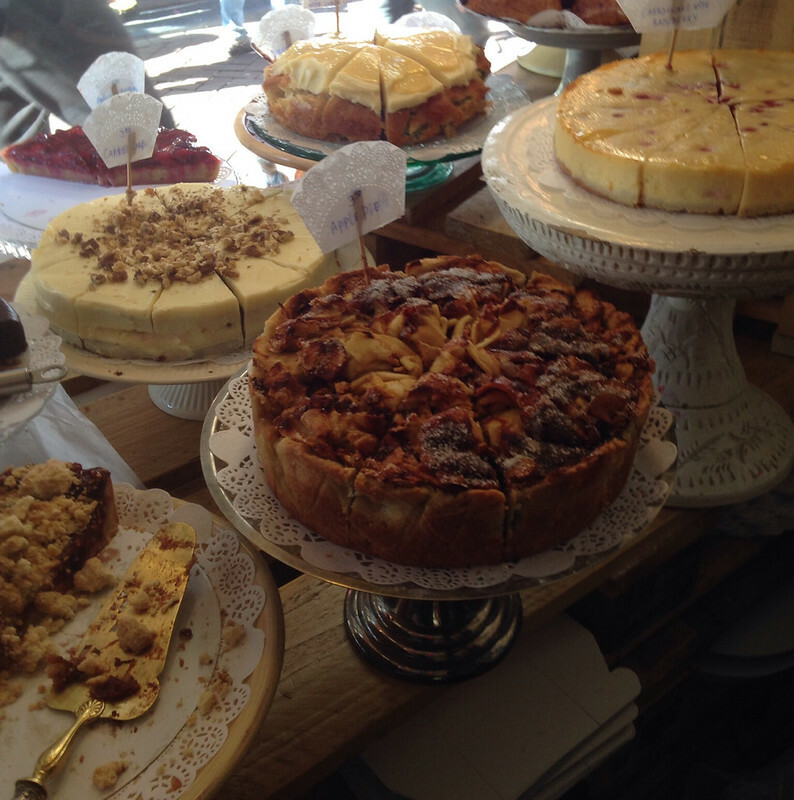 It was a quirky cake shop with mis-match furniture and huge, elaborated decorated cakes in the window and on the tables as centerpieces. It definitely had a bit of a rough-round-the-edges feel. We cycled over to this place specifically, and due to our hire time rapidly running out, we didn’t have long to sit and relax, but we did have time for cake and tea each. 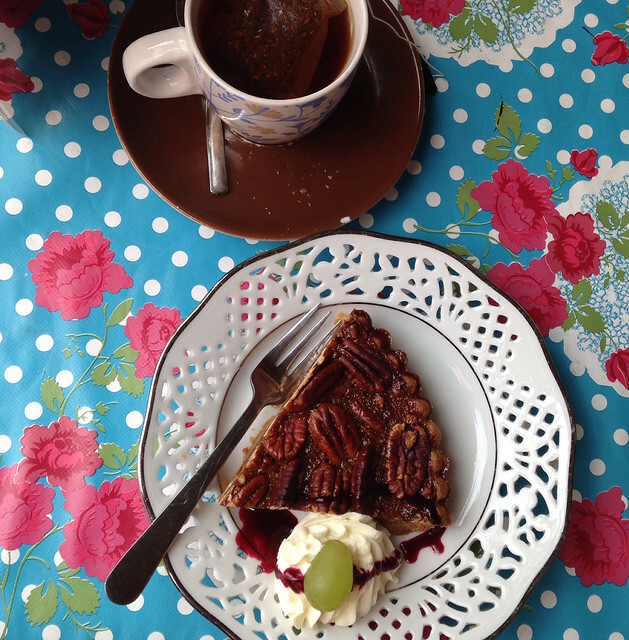 My decision was quick and easy – as soon as I saw pecan pie in the fridge I didn’t need to look any further. I had a cup of my current favourite tea – rooibos. So unnecessary, but yum, yum, yum. Finally! Some really rather excellent savoury food. Another place we just happened to pass, we were so, so happy with the food, ambiance and service at The Lobby. Attached to the also rather lovely looking Hotel V, we had a quick late lunch (around 4pm) here on our final day. After a lot of cake, a really scrummy, fresh meal was exactly what we were after, and the interesting menu didn’t disappoint. 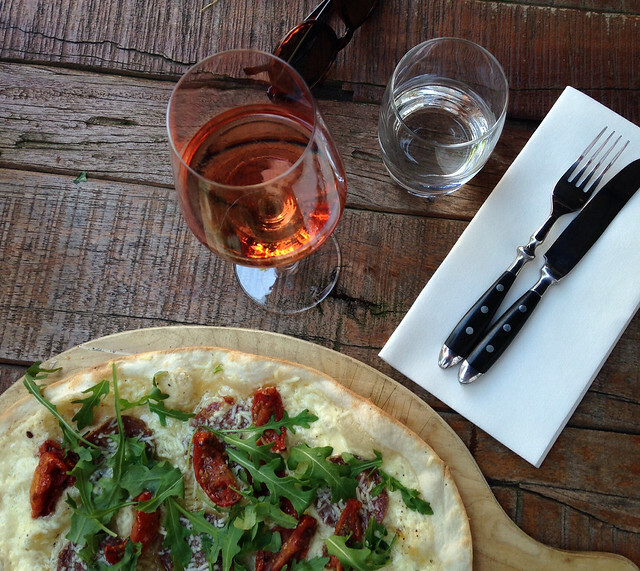 I had a ‘Famous Flammkuchen’ (a thin crust pizza spread with crème fraîche – €10) along with a glass of rosé (around €5.50). I want to go back here again, to eat and to stay. A cosy restaurant with a lot of exposed brickwork and super friendly staff who treated us to exactly what we needed (huge glasses of fresh mint tea and a plug for some iPhone charge) on our first night. I wish we’d had time to go back again for food and some (harder) drinks. 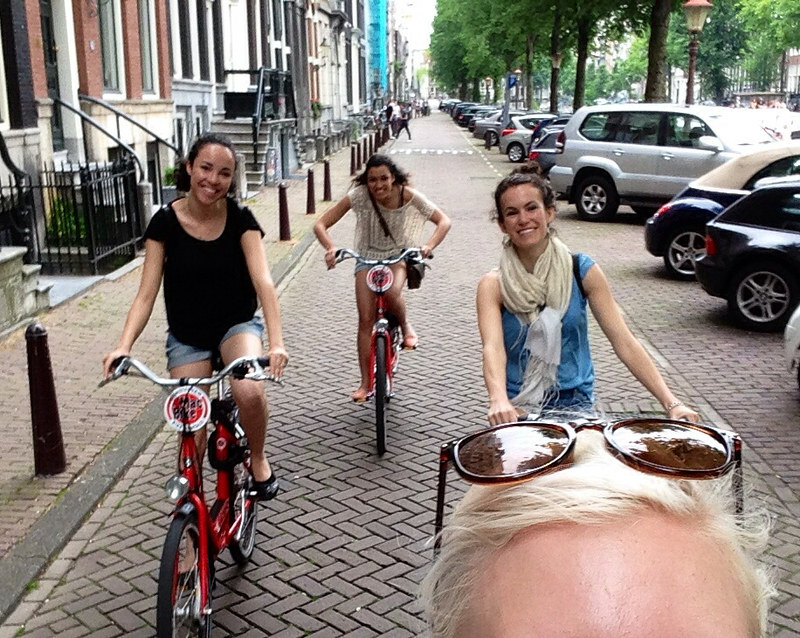 You kinda have to hire a bike whilst in Amsterdam, right?! Annoyingly, we ended up hiring them from one of the most chain-y places, which meant a) our bikes were bright red and branded so it was super obvious we were tourists and b) we probably paid more than necessary for the hire. But it was fun. I rode at the front of our four person peloton, iPhone clamped in hand the whole time as I navigated us (still badly) around the city. I love how bike friendly Amsterdam is (although I still think I felt safer on a bike in Copenhagen), with it’s wide, obvious cycle lanes and just bikes just generally being EVERYWHERE. I really wish it was more like that in London. As well as a bike, it’s pretty necessary to get on the canals too. On our final day, we bought a hop-on hop-off Canal Bus ticket to get around the city, and specifically to the further out parts we were yet to visit. I always love going on guided bus or boat tours in new cities, I think they’re a great way to see loads of the city and to help get your bearings. Again, we just happened to pass by this place – you must Google it, I didn’t get a good photo of the building itself, but it’s completely sloped on one side, so you can walk up the side of the building from the ground to the top. Up there is a café, outdoor games and paddling pool for children. We just sat for a bit and took in this view. I do love a good view.